These invitations were made primarily with Scrapbooking products. I wanted something to reflect my style and my love for all things paper for my wedding invites. I managed to stick to a super tight budget and save a lot of money. No Glue or Tape used at all. Yay! I picked up a few stacks of themed scrapbook pages at my local discount department store for the backing of my invitations. I cut the back of each invite out using my template and a craft knife. To find the perfect invitation template I experimented with a variety of plates, trays, books & DVD cases until I settled on the lid of a letterset box as my template. 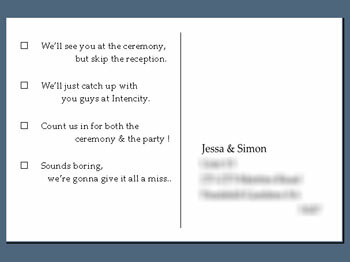 Hot tip: When creating a template for your invitations it is important to factor in the envelope size that you will require and associated mailing costs. Find out this information before you plan and design your invites. Each invite background is cut from a different design of card from the scrapbook stack - so even though they all carry the same theme, everybody I sent one to gets a different design. The details of the event were typed in MS Word & printed onto sheets of cheap vellum I purchased from an office supply store. I printed them with my cheap Canon inkjet printer, then instead of cutting them to size to fit onto the patterned card I used a ruler and tore the vellum along it. Not only is this a BAZILLION times easier than cutting each sheet with a craft knife or scissors, but it also gives a really nice effect. I measured the vellum sheets to be 1/4" smaller than the backing so that I had a 1/8" border all the way around. With all the pieces of the invitation prepared, all that was left was to assemble them. Our RSVP offered four options each with a tick box to select. Count us in for both the ceremony & the party! I found that our postal service offers special, event themed stamps. 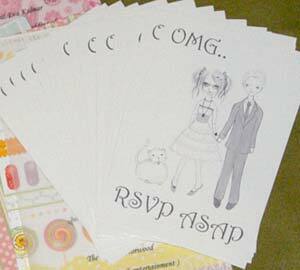 I ordered beautiful flocked & foiled ones decorated with hearts - and they made the RSVP's so much prettier!